ATTEEEEENTION! At long last...the new feature is up! BROTHERHOOD OF DUTY. Tracksounds is proud to bring you an exclusive look at the music from the BROTHERS IN ARMS franchise and CALL OF DUTY: WORLD AT WAR. 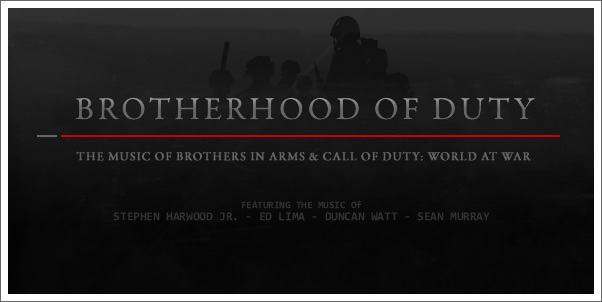 Including full reviews of all three BROTHERS IN ARMS game soundtracks and the promo release of CALL OF DUTY: WORLD AT WAR. You will also find interviews with composers ED LIMA, DUNCAN WATT, STEPHEN HARWOOD JR. and SEAN MURRAY. Don't miss our streaming player offering you a chance to listen to the musical scores from all four games! Proceed to the feature here!